While it may be hard to believe at first, almost everything that occurs in your pond will be influenced by metabolism. Specifically, the quality of the water is determined by the metabolism of the fish, bacteria, algae and plants. Other components that will influence it include oxygen levels, rain, sunlight and the ratio between algae and bacteria, as well as organic waste and temperature. Metabolism will influence your pond in both obvious and subtle ways. While many of the components which influence your pond’s metabolism are difficult to predict or control, others are relatively easy. One such component is the metabolism of your fish. It is determined partly by the temperature and quality of the water, which you can test, and since koi fish have cold blood, their metabolisms are largely influenced by the surrounding environment. Their metabolism will slow down when the water temperature around them falls in temperature. With a bit of feeding knowledge, pond owners can effectively manage this issue. When the temperature of your pond water falls to 55 degrees or lower, discontinue using standard fish food and change to cold water feed instead. If the temperature falls further to 42 degrees or lower, discontinue feeding your fish entirely. The reason for this is because once the water temperature falls to 42 degrees, the metabolism of your fish has slowed to the point where they won’t eat much of anything you offer them. As a consequence, the excess food will just float in the water and rot, which will erode the water quality while making the fish sick. The metabolisms of bacteria and algae will also slow with declining water temperature, so any additional organic materials won’t help. Things get complicated with temperatures that are higher than 42 degrees but beneath 55. This is because the fish will still have to be fed, but since their metabolisms have slowed down, this means that their digestive system isn’t as effective. This is why cold water feed is so important, because it has been designed for easy digestion and is perfect for nourishing fish with slower metabolisms. If you continue giving your fish standard feed when their metabolism slows down, you are placing their health in jeopardy. 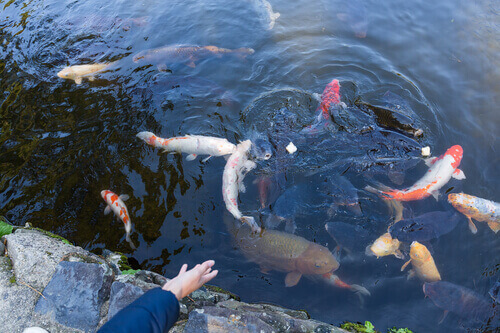 Food which is not properly digested or uneaten entirely will make the pond water imbalanced, and given the fact the pond’s surface will usually freeze over during winter, this means that your fish would be confined to unhealthy water for months until the surface unthaws in spring. Once that happens, you could potentially face a large algae bloom and or the deaths of a large portion of your pond fish. This is why cold fish feed is so essential for winterization. It has been scientifically designed to maintain the health of your fish during winter, and consists of premium ingredients which are Wheat Germ formulated. They ensure that your fish will be able to digest their food comfortably while making their scales and color vibrant.